Masonry a Way of Life! Worthy Grand Matron Linda Glines, Worthy Grand Patron Lee Rogers and our Grand Family. Get a Subscription to the Eastern Star Journal! The Grand Chapter of Utah has been saddened by the loss of three Past Grand Patrons last year. Ralph B. Hodges, Wayne R. Rives and Bill Jack Westbrook. On January 3rd, 2019 we lost Sister Ruth E. Lay, Past Grand Matron. the Huntsman Cancer institute or Salt Lake City Shriners Hospital Orthotic and Prosthetic Services. Bill Jack Westbrook passed away September 5th. He was a past Associate Grand Guardian of Utah and an Associate Guardian for many of the girls in several Bethels. His wife Tricia would like to create a Jobie scholarship that would be given out at rally in his memory. Terry Haven is coordinating this for her and would love for you all to consider donating to the Bill Jack Westbrook memorial scholarship in lieu of flowers. You can make a check out to the Grand Guardian Council of Utah and put Bill Jack memorial in the memo/for line. Send checks to Terry Haven at 2120 S. Hannibal St. SLC 84106. Thanks so much in advance. The girls and this organization was dear to his heart. Saturday, February 23rd at 3:00 pm, 1339 W. 400 N. One mile east of I-15 at exit 346. The Grand Chapter extends our sympathies to her family and friends. General Grand Chapter of the Order of the Eastern Star has a Permanent Disaster Relief Fund. of disasters throughout our Eastern Star World. Please contribute generously through your Chapter Secretary. Worthy Grand Matron Linda and Worthy Grand Patron Lee have some wonderful activities planned this year! Be sure to check the updated Calendar for a complete list! Feel free to add activities from your Chapter! SAVE THE DATE: Many fun activities this year, Please Join Us! Here are the hotel accommodations AGM Kristyne Sandstrom has booked for the Grand Visitations. EL KALAH Shriners is now selling those Vidalia Gems! Flyer Here! 10-pound bag of onions for $12.00. 5-pound bag of onions for $6.00. Onion cookers for $6.00 each. VIDALIA Blossom dipping sauce $6.00 per bottle. Order through your Secretary and earn money for your Chapter! 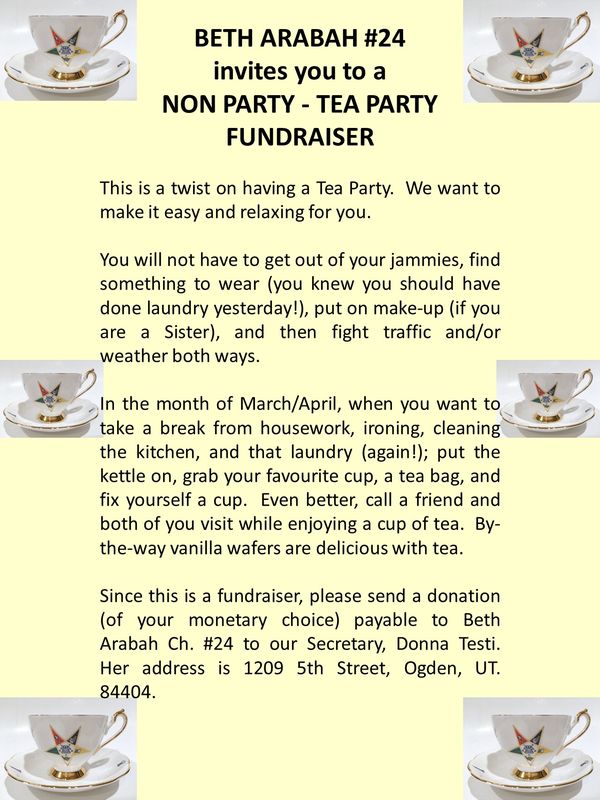 Beth Arabah Chapter is having a No Party, Tea Party fundraiser. Enjoy a cuppa as you are! Flyer Here! April 5-6, Hands Across the Border, Elko Ch. #17, Elko, NV. Flyer Here! April 12 - 13, 2019 Four Corners Rendezvous, “The Romance of the Titanic” Flyer Here! April 26-27, Quad State Extravaganza, St. George Flyer Here! May 4, Run for the Roses Charity Event! $20. Lee and Linda Rogers Home. Flyer Here! 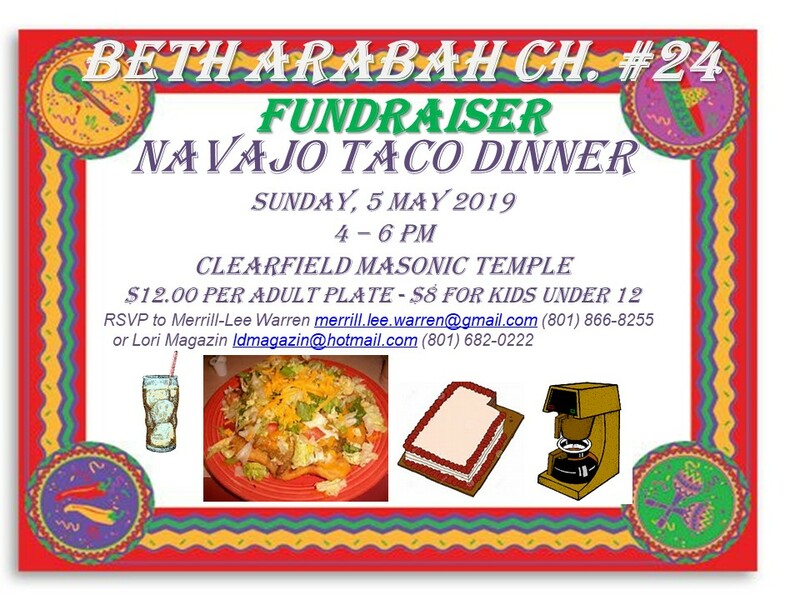 RSVP to Merrill-Lee Warren 801-866-8255 or Lori Magazin 801-682-0222 Flyer here! Price Masonic Temple. RSVP to Deserae Stevenson (435)621-4818 Flyer Here! May 11, Bethany Ch. #9 Grand Visitation, Meeting 1pm, Mickey and Minnie's Marvelous Picnic to follow. Green River Masonic Lodge. Benefit Picnic $15 Flyer Here! Desert Star Banquet Room, 4861 S. State, Murray, Flyer Here! Saturday, June 22nd Mount Olympus WGMatron and WGPatron's homecoming. Brunch served by Twin Peaks Lodge #32 before the meeting. Times and details to follow! June 27-29, Grand Chapter trip the Gathering at Pahaska Tepee, Buffalo Bill’s Historic Lodge. Museums, Rodeo, Relaxing and more! Flyer Here! Dinner, $30 Reservation Flyer Here! 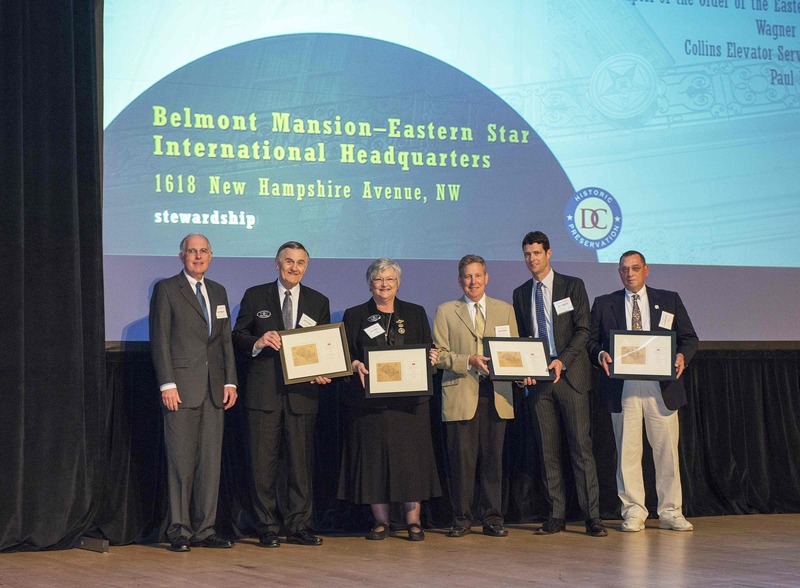 Washington DC has received the DC preservation league's prestigious Stewardship Award! Here is a YouTube video about the Mansion. Here are more details about the Mansion. and GGC Secretary Alma Lynn Bane for their care of our Headquarters! A 501 (c) 3 foundation is now available for tax deductible donations! Congratulations to our newly appointed members of General Grand Chapter for the Fiftieth Triennium 2019-2021. We look forward to your contributions to our future! 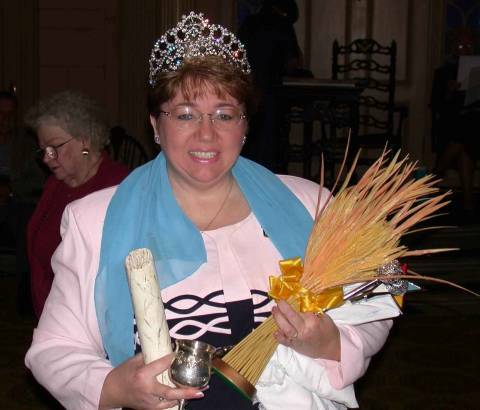 The Order of the Eastern Star is the largest fraternal organization in the world to which men and women may belong. It encircles the earth with over 5,500 Chapters in the United States, Canada, and 13 other countries. Though its teachings are based on the Bible the Order of the Eastern Star espouses no religion and is neither secret nor political. Its members are comprised of men who are Master Masons and women with specific Masonic relationships. Millions of dollars are raised annually within its membership for numerous projects which benefit mankind. Many national and local charities are among the projects supported by its members. Through this fraternal service to humanity, its members strive to build a better, more fulfilling way of life for all. Copyright 2019 Grand Chapter Order of the Eastern Star of Utah, Inc.